"Any news about the unification is fake." 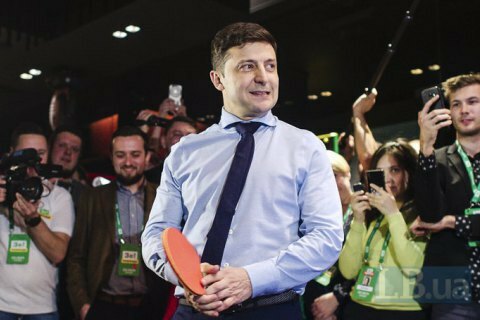 Ukrainian presidential election frontrunner and comedian Volodymyr Zelenskyy has said that he is not going to join forces with any candidate ahead of the runoff. "I am not going to unite with anyone, this is some fake [news]," he answered an LB.ua correspondent's question about a possibility of him joining forces with Yuliya Tymoshenko, whom the exit polls placed third. According to the National Exit Poll, Zelenskyy scored 30.6%, incumbent President Petro Poroshenko, 17.8%, and Tymoshenko, 14.2%.